This is one of the many delightful dishes at Tara's Cafe, a restaurant tucked inside a small street in Guadalupe, Cebu City. Their Baby Back Ribs dish looks very appetizing in this picture, and I guarantee you that the real thing will not disappoint. Offered for only Php175, it's definitely good value for your money. Opened last year, Tara's Cafe offers a variety of dishes and their cuisine is mostly Filipino, though they also serve a few salad and pasta dishes. Here are some of the items that we ordered for our visit there, all seafood selections. 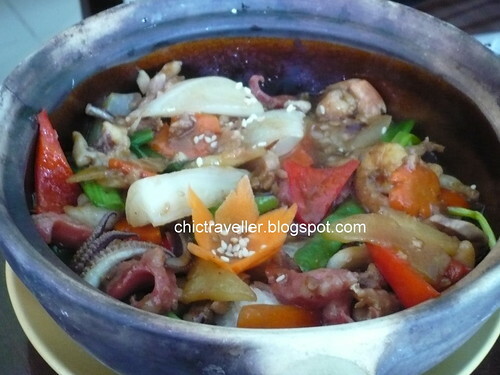 This is the Mixed Seafoods Hot Pot (Php180). This dish would make the health-conscious happy. It's composed of fish, squid and shrimp mixed with various vegetables. 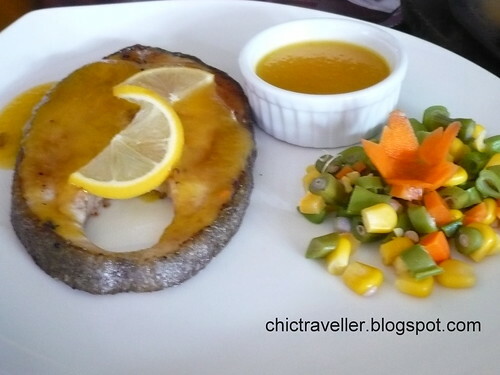 For those who love to eat fish, they also have the Lemon Marlin Steak (Php160). This is the one that I ordered, and I absolutely love it! It's grilled marlin with lemon sauce and it comes with vegetables as side dish. I loved the lemon sauce because it was very Filipino. It had a sweet aftertaste, which we Filipinos are very fond of. Here's the Breaded Fish Fillet (Php160). 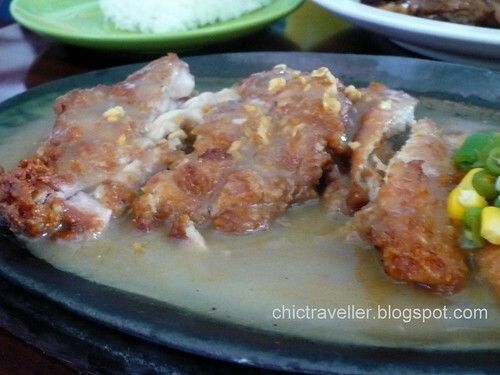 The sauce is different, since most of the fish fillets I've tasted comes with a sweet and sour or mayo-based sauce. It comes with a side dish of vegetables too. 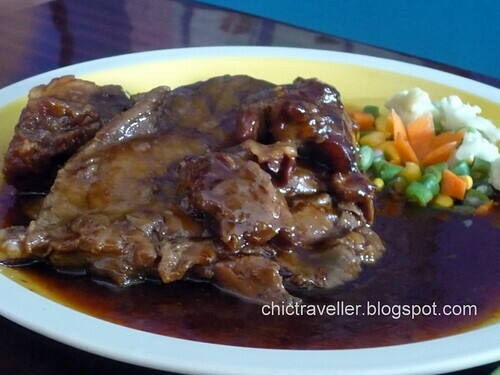 For the meat lovers, they also offer a wide selection for beef and pork dishes. Old favorites like the Sisig Sizzler, Boneless Crispy Pata, Kare-Kare and Caldereta are available. Even though Tara's Cafe is located in a side street, a lot of people go there. Parking is easily available. Though the cafe itself only has a few parking slots outside the restaurant, cars could park along the nearby roads. 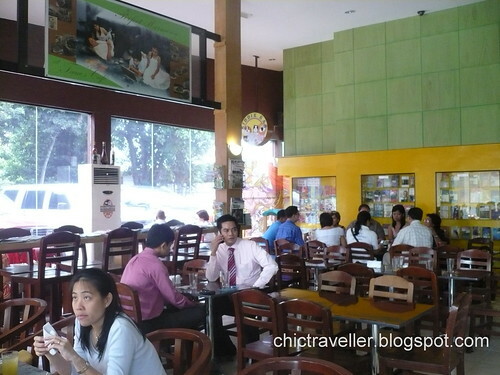 Aside from its good food, Tara's Cafe offers a unique concept that encourages people to visit and stay. They have WIFI available for tech-savvy customers, and they also have book selections which you can borrow for your stay there. These books are pre-loved, and they're available for sale too. For those who bring their children along, they have a Kiddie Bar where the little tots could stay. 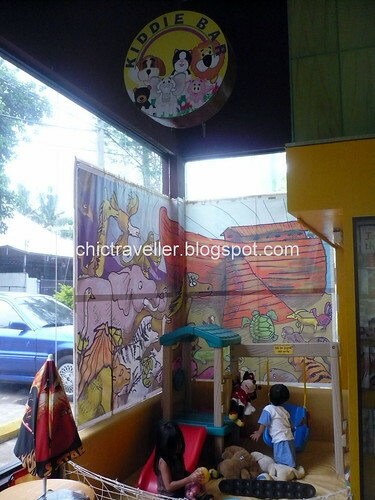 They have a few toys and a little playground, and kids would surely not get bored staying at the cafe while the adults do their own thing. All in all, Tara's Cafe is a unique experience. It's a breath of fresh air for the traditional cafe setup, and everyone is invited to come and stay. Here's another bonus: The staff's very friendly and courteous. They're trained to always say "Thank You" and "God bless!". Even the guards and the boy who watches over the cars say these, too. Could we exchange link and posts ?! hi dinh! thanks! sure, we could exchange links. what title would you want for your link? Pls revert your details then i could add yrs. wow! nagutom ako! okay, naog nako to buy food...hahaha!